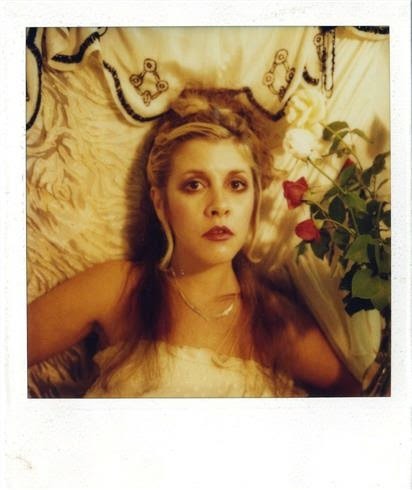 After a successful run in New York City, a collection of Polaroid self-portraits -- old school selfies, if you will -- that Stevie Nicks took of herself in the '70s and '80s is going on display starting today in Miami, Florida, as part of the city's prestigious Art Basel show of modern and contemporary art. Unlike these days, when taking a picture of yourself is as easy as breathing, Nicks says creating her portraits -- featured in the packaging of her current solo album, 24 Karat Gold -- was "a huge deal," adding, "It was like writing a song." "You know, that Polaroid had a button that plugged into it and then it was on a long cord and that was on a tripod. So it really was a thing," she tells ABC News Radio of the portraits, for which she styled herself in a variety of costumes and poses. "So if I was setting up...to take photographs, I could set up a whole scene, and then...leave it set up for two or three days. So I could take two or three nights after shows, and really go for that one shot." Complicating the process was the fact that Stevie was working alone, often in hotel rooms in the wee morning hours, to capture those photos, and there were a lot of factors working against her. "There's too much light, there's not enough light. It's the wrong kind of light. I don't have the right light so I'll have to wait until tomorrow," she recalls of her creative process. "I'm out of film, I have to wait until tomorrow. I don't have the right makeup, and I'm taking notes as I go along. It was a huge deal. It was like writing a song." Not only that, but the singer says she wasn't satisfied with the first photos she took, or even the second or the third ones. "Each one of those shots, it was like another 20, 30 of those shots that I cut up with scissors and threw away, until I got the picture," she tells ABC News Radio. "And then only those pictures went into the shoeboxes, which went into a truck and then went home and went into a storage box." That is, until her pal Dave Stewart of Eurythmics decided to go through those shoeboxes, pick the best ones, enlarge them and put them on display. The photos can be seen at the Dream Hotel South Beach though Friday. Asked if she feels camera-phone technology has denigrated the art of photography, Nicks says, "Very much. I think it's really too bad." In addition to promoting the photos, and 24 Karat Gold, Stevie's currently on tour with Fleetwood Mac; her next gig with them is this Saturday in Inglewood, California. It's no longer an easy thing to take selfies on mobile these days anyway! We've come a long way since that ipod in self storage mates!